There are all kinds of crazy things people claim to know about pregnancy and the advice being given by almost everyone that pineapple causes miscarriage is one of the most common one. During pregnancy, what a woman eats and doesn’t eat, takes on a whole new priority level. Eating while you’re pregnant takes careful planning to ensure that you’re obtaining all the nutrients you need to carry your baby to term, as well as all the vitamins and minerals your growing baby needs. An embryo goes through rapid growth during the early days and weeks after conception and needs specific nutrients to develop normally. Expectant mums are bombarded by advice, suggestions and warnings from all angles. It can be difficult to take it all in, to know what’s real and what’s based on cultural or religious superstition. You are expecting your first child and are feeling both excited and nervous. Everyone is doling out advice about almost everything, including what you should and should not eat. In this flurry of information overdrive, here’s what you need to remember: On an average, you require between 1,800- 2,000 calories per day. If you are pregnant, you need only about 300 calories extra each day for you to stay healthy and help your unborn child grow. You certainly do not have to ‘eat for two’ as the old saying goes. 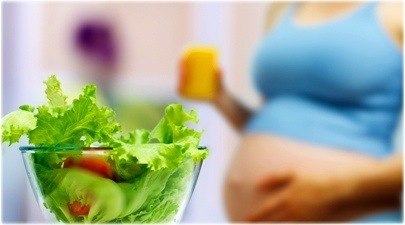 There are many misinformed advice about what to eat and what not to eat during pregnancy that circulate the Internet. One such advice is that pregnant woman should avoid eating pineapple as it causes miscarriage. However, in reasonable amounts, pineapple is highly unlikely to cause any trouble. It’s a nutritious fruit that supplies key nutrients essential during early pregnancy. This myth of pineapples being problematic during pregnancies is because of a compound found in pineapples called bromelain. The logic is that bromelain breaks down proteins– and because your young embryo is made up of proteins, bromelain consumption can cause bleeding and miscarriage, explains author Rana Conway, who wrote What to Eat When You’re Pregnant. Though bromelain capsules might raise the risk of a miscarriage, simply eating some fresh pineapple isn’t likely to have any effect. FACT: Contrary to popular beliefs, having one or two cups of fresh pineapple each week during early pregnancy is typically safe. A cup of fresh pineapple alone is a simple and nutritious way to add fruit to your pregnancy diet. You can also add pineapple to a fruit salad or puree it in a fruit smoothie. Top grilled pork chops with diced pineapple to add a bold taste and essential nutrients to the meat. Layer pineapple slices into a grilled chicken sandwich or top a chicken and spinach salad with the fruit as additional ways to include it in a healthy, early pregnancy diet. The key here is moderation. There is no conclusive evidence that consuming pineapple in normal serving sizes will cause uterine contractions. 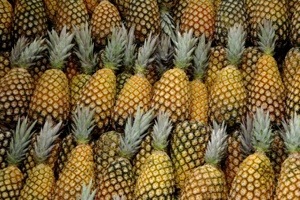 In fact pineapple contains lots of vitamin C which will help support both you and your developing baby. —First talk to your doctor and acupuncturist/herbalist about it. —If you are taking baby aspirin, a blood thinner, remember that pineapple is also a mild blood thinner and too much could lead to miscarriage. Ask your doctor before taking both. —Don’t start eating pineapple until after ovulation as it can actually inhibit pregnancy if taken too early as the acidity of pineapple can effect cervical mucous. —Cut up a whole pineapple, cut the core into 5 pieces and eat once piece daily starting the day after ovulation/IUI/IVF transfer. —If you don’t have a fresh core, eat one cup of pineapple meat a day once a day starting the day after ovulation/IUI/IVF transfer. —Canned pineapple has been heated which destroys the Bromelain so you have to eat fresh pineapple. This entry was posted in Food & Drink, pregnancy & childbirth, tips by alittlechanelscarf. Bookmark the permalink.